This example shows how to automatically tune a PID Controller block using PID Tuner. 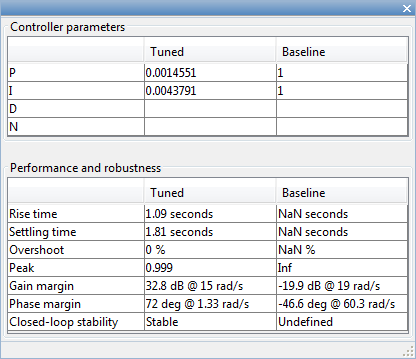 PID Tuner provides a fast and widely applicable single-loop PID tuning method for the Simulink® PID Controller blocks. 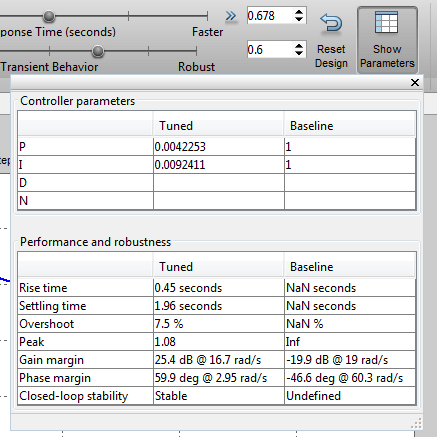 With this method, you can tune PID controller parameters to achieve a robust design with the desired response time. (1) Launch the PID Tuner. When launching, the software automatically computes a linear plant model from the Simulink model and designs an initial controller. (2) Tune the controller in the PID Tuner by manually adjusting design criteria in two design modes. The tuner computes PID parameters that robustly stabilize the system. (3) Export the parameters of the designed controller back to the PID Controller block and verify controller performance in Simulink. 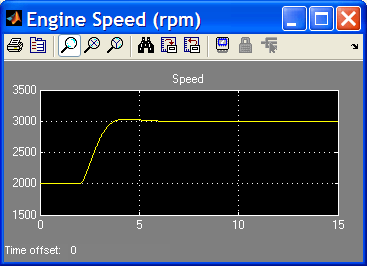 Open the engine speed control model with PID Controller block and take a few moments to explore it. Zero steady-state error to the step reference input. In this example, you stabilize the feedback loop and achieve good reference tracking performance by designing the PI controller scdspeedctrl/PID Controller in the PID Tuner. To launch the PID Tuner, double-click the PID Controller block to open its block dialog. In the Main tab, click Tune. When the PID Tuner launches, the software computes a linearized plant model seen by the controller. The software automatically identifies the plant input and output, and uses the current operating point for the linearization. The plant can have any order and can have time delays. The PID Tuner computes an initial PI controller to achieve a reasonable tradeoff between performance and robustness. By default, step reference tracking performance displays in the plot. 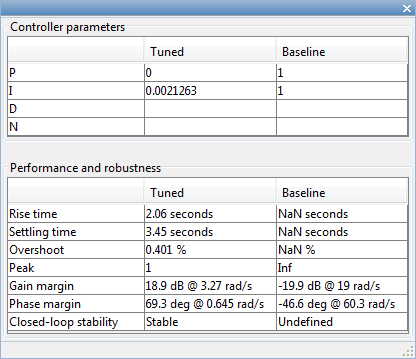 Click Show parameters to view controller parameters P and I, and a set of performance and robustness measurements. In this example, the initial PI controller design gives a settling time of 2 seconds, which meets the requirement. The overshoot of the reference tracking response is about 7.5 percent. Since we still have some room before reaching the settling time limit, you could reduce the overshoot by increasing the response time. 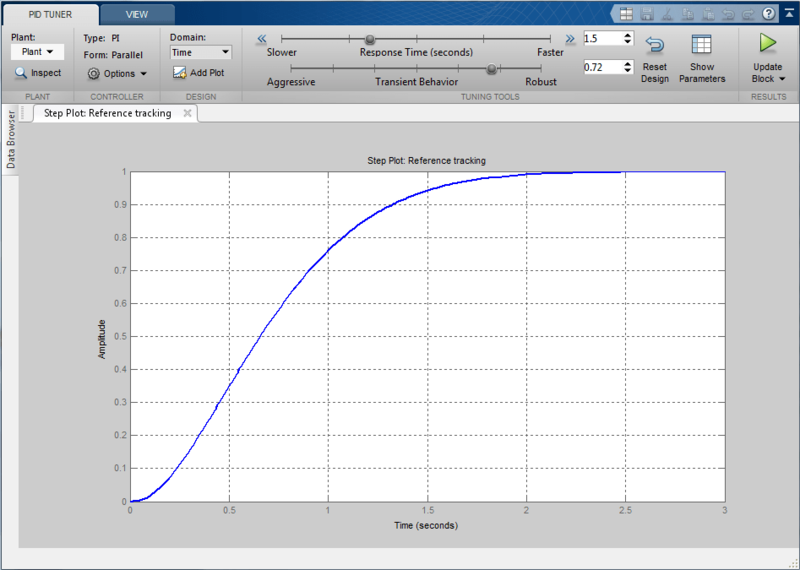 Move the response time slider to the left to increase the closed loop response time. 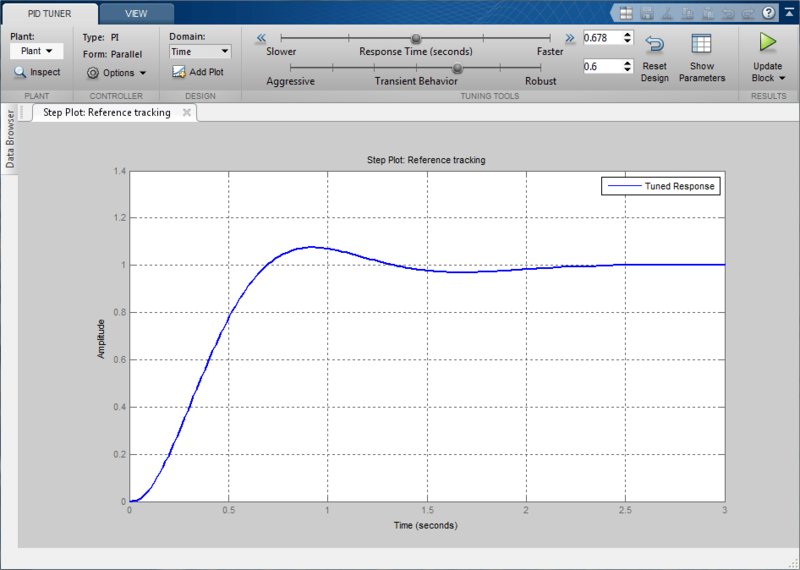 Notice that when you adjust response time, the response plot and the controller parameters and performance measurements update. The following figure shows an adjusted PID design with an overshoot of zero and a settling time of 4 seconds. The designed controller effectively becomes an integral-only controller. In order to achieve zero overshoot while reducing the settling time below 2 seconds, you need to take advantage of both sliders. You need to make control response faster to reduce the settling time and increase the robustness to reduce the overshoot. For example, you can reduce the response time from 3.4 to 1.5 seconds and increase robustness from 0.6 to 0.72. After you are happy with the controller performance on the linear plant model, you can test the design on the nonlinear model. To do this, click Update Block in the PID Tuner. 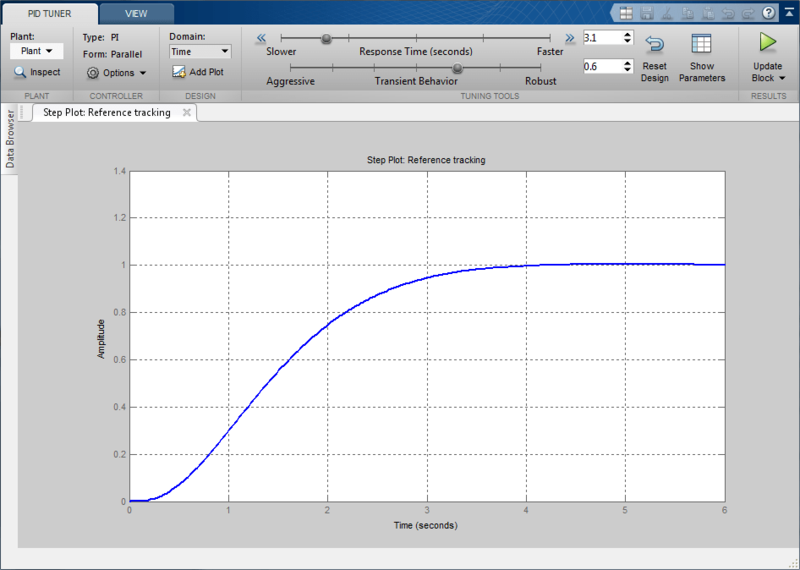 This action writes the parameters back to the PID Controller block in the Simulink model. The response shows that the new controller meets all the design requirements. You can also use the Control System Designer to design the PID Controller block, when the PID Controller block belongs to a multi-loop design task. See the example Single Loop Feedback/Prefilter Compensator Design.